Congratulations: Last Friday evening local woman Jacqueline (Jackie to her friends) Ashdown was awarded the 50 years long service medal for her contribution to the world of Guiding. It was presented to her by the High Sheriff of East Sussex, John Moore-Bick, in a ceremony at East Dean and Friston village hall. The mother of four has enjoyed service as a Guider to the 1st Burwash Guides and Brownies. She was also District Commissioner for several years. Jackie so deserves this accolade as she is always in the thick of any fund raising the group do, she has loved giving the young women a sense of fun and achievement through guiding. Jackie was joined by another lady who also received her 50 year award and two who received their 60 years award. Congratulations Jackie, this is such a well deserved honour. Bazaar: Don’t forget to go to the Burwash Primary school’s Christmas bazaar this afternoon. It is being held at the school and in St Bartholomew’s church from 3.30 to 5.30pm. There will be lots of things to do, lots to try, lots to buy, and lots to eat. Santa will be in his grotto and is looking forward to seeing the children. Entry to the bazaar is free. All profits will go to the school. Coffee morning: The Burwash and district flower arrangement club are holding a Christmas coffee morning, tomorrow from 10am to 12 noon at the Scout hut in the Bear car park. Entry is £2 and includes tea/coffee and a mince pie. There will be a sales table, gifts, raffle and cakes. You are all very welcome to go along. Service: The family toy and blessing of the crib service will take place on Sunday morning in St Bartholomew’s church at 10am. The children will be able to take along toys for those less fortunate than themselves. This is always a beautiful service to attend and you are all very welcome. Walk: The last walk for strollers of the year will take place on Wednesday morning. 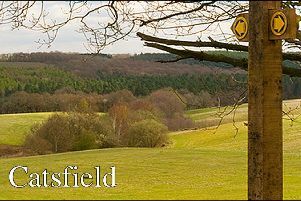 These walk are a gentle way to enjoy the fresh air and countryside in the company of like minded people. Iron Jenner will lead the walk which sets off from The Bear car park at 9.00am. Do go along, especially if you are new to the area. It is a great way to make new friends and to learn more about the place you live. The walks finish in time for lunch. Festive fun: The Burwash festive evening is being held on Wednesday from 4.30pm. This is a great evening with lots of events, stalls and games going on all round the village. There will be stalls in the Bear & Rose & Crown, lots of things happening in the scout hut, at the Catholic Church. Barbecue, hog roast, mulled wine and more. Local businesses will be open and The guides will be hosting Santa’s grotto as usual at Cheriton, in the high street. The pentacle drummers will be with us again. And of course the lighting of the Christmas tree and lights in the high street. This is a great evening that the whole family can enjoy and goes on until about 8pm. Whist: The Christmas Whist drive will be held on Thursday evening at the Burwash village hall. Starting at 7.00pm with 20 hands of cards and light refreshments at half time, all for £4 per person. These are fun, friendly evenings enjoyed by players of all levels of ability. Parking is available in the Catholic Church opposite the hall. You will be given a warm welcome so why not go along, you don’t even need a partner and you don’t have to live In the Burwash villages. For more information please call Shirley Viney on 01435 882497. Bingo: The Christmas charity bingo will be held on Sunday 9 December in the Burwash village hall from 3.30 pm. The doors will open at 3.pm. (Regular players, please note the letter start time). There will be lots of great festive prizes and fun the whole family can enjoy. Entry is free with books of 12 games and 24 chances to win only £1. Fliers and a raffle too. If anyone has any prizes they wish to donate they would be very gratefully received. Please cal Mary on 01435 882107. Christmas tree: The annual St Bartholomew’s Christmas tree festival will take place from 7 to 9 of December in the church. Fridays will be by ticket, but on Saturday you can visit from 10am to 4 pm and on Sunday from 11am to 5 pm. Will post more details next week.